Was Manny Pacquiao’s Win That Close? A pro-Mexican crowd may have booed all night long but how does anyone really think Juan Manuel Marquez came close to winning the WBO welterweight title from champion Manny Pacquiao Saturday night in Las Vegas? If it were not for Pacquiao there would not have been a fight! You don’t lay back in the final round because your trainer miscalculates you have already won the fight. You fight to the finish like real Mexican Warriors do! Officially if he would have won the final round he would have received a draw. The two clear rounds Marquez won were the second and seventh rounds. Every round seemed competitive and neither dominated a round. Robert Hoyle’s 114-114 seemed way out of line for this writer. Dave Moretti called it 115-113 and Glen Trowbridge 116-112 for Pacquiao. This writer had it 118-110 for Pacquiao. If you had it 116-112, I wouldn’t argue with you. But a win or draw for Marquez?! 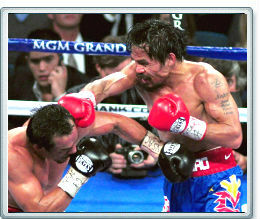 In the tenth round a clash of heads caused the cut that went vertically through the right eye brow of Pacquiao. A cut lip happened around the seventh or eighth. Marquez certainly looked the worse for wear between the two at the end. Though it was a good fight it didn’t seem to merit much excitement for a rematch. Pacquiao, 53-6-1 (39), is a 6-division world champion who has won his last 15 fights, 7 by knockout. Only 32 he may be looking to call it a day in another year and two fights if his political career takes off! He’s already made more money than he will ever need living in the Philippines. He drew with Marquez in 2004 while winning a split decision over him in 2008. What would be the purpose of a fourth fight? What the future holds for Pacquiao is his No. 1 contender Mike Jones, 25-0 (19) of Philadelphia who meets Sebastian Andres Lujuan of Argentina December 3rd. Jones is No. 2 and Lujuan No. 3 in the recently vacated WBC ratings with Andre Berto bowing out. If the Jones – Lujuan fight or the Randall Bailey – Carson Jones fight produces the champion they could pose as a future opponent. Tim Bradley’s impressive WBO title defense win on the undercard stopping Joel Casamayor could line him up for a title bout with Pacquiao. It’s doubtful the WBA champion Vyacheslav Senchenko, 32-0 (21), of the Ukraine is even being considered. Being it was the fourth straight decision win for Pacquiao he may have fallen into a lack of knockout rut. He may be starting to grow lackadaisical in his recent performances. He hasn’t lost a fight since 2005. Marquez is a 3-division champion now living in Anaheim, CA, and is 38 years of age and now considering retirement. The two fighters know each other too well it may seem to put on an exciting fourth fight. Besides Pacquiao owes it to his welterweight contenders not to fight say a light welterweight in Bradley after defeating the lightweight champion. If Jones is impressive with Lujuan he may be in line in six months. Marquez is still the WBO lightweight champion and could always move up to light welterweight and take on Bradley. Then the winner may get a shot at Pacquiao. So, where does this leave WBC champion Floyd “Money” Mayweather? He is planning a May of 2012 fight. His No. 1 contender is former IBF/WBC light welterweight champion Devon Alexander who hasn’t had a welterweight fight since 2007 but managed to get into that divisions ratings. If both Mayweather and Pacquiao fight in the May of 2012 time there could finally be their match-up in November of 2012 or the retirement of both. Mayweather has been the problem in getting the two together. After his lopsided win over Marquez maybe he might not think Pacquiao is “superman” and agree to fight him. Mayweather is two years older than Pacquiao at 34. His out of the ring problems never seem to go away. He seems to fight for the money that he goes through quite fast. Pacquiao does not have that problem. Even after Mayweather took off for more than a year their match-up was still in the news and on fight peoples minds. It would be the biggest money fight in the history of boxing. I wouldn’t look for it next time each fight but two fights and a year from now why not? Pacquiao is still the man and pound for pound the best if for no other reason his activity compared to Mayweather. Lack of competition may finally draw the two together. One thing for sure it looks like 2012 will be a big year for both!